Amongst the crowds of tourists craning their necks at Michelangelo’s famous ceiling and the pile of young artists sketching Hercules and Cacus, lies a passageway filled with centuries worth of priceless art. The Vasari Corridor is a kilometer long passageway that connects the Uffizi Gallery to the Pitti Palace. A walk through the corridor has been compared to stepping into another dimension. The calm, quiet atmosphere is unlike any other portion of the gallery and visitors become easily lost in the world of each piece of art as they journey from one to another. The Grand Duke at the time could have been easily identified as an agoraphobe, as the corridor was created so that he never had to leave his property. With the new addition, he could move freely between his residence and the government palace. The foul smell of the meat markets located underneath the Corridor did not please the Duke, however, and they were quickly replaced with jewelry shops. For at least 200 years, the corridor was used only as a passageway back and forth between the two residences. When the Lorraine family took over Tuscany, the Uffizi Gallery became private property. In 1939, Benito Mussolini ordered the Corridor’s small windows be enlarged so that he could admire the great panorama over the Arno to Ponte Santa Trinita. 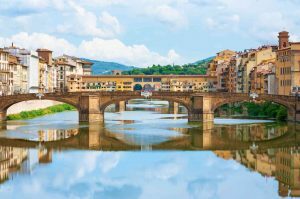 When Adolf Hitler visited Florence, he was so impressed by the beautiful view that he ordered the Ponte Vecchio bridge be saved from German bombing during the second World War. Unfortunately, all other bridges were destroyed. Perhaps one of the most impressive aspects of the Vasari Corridor is the elevated and privileged position of the building. This allows sightseers to view some of the most lovely scenes of Florence’s city center. Much how the Grand Duke wanted to walk freely through his home, visitors can view the spectacular city away from the bustle of tourists. AESU offers several trips to Italy, including: Cosmopolitan, Explorer, Euro Focus, Great Escape, Viva Italia, and Euro Spree. Explore Italy and its interesting culture, plus experience some of the greatest food and wine in Europe! This entry was posted on Wednesday, February 1st, 2017	at 2:27 pm	. You can follow any responses to this entry through the RSS 2.0	feed. Both comments and pings are currently closed.